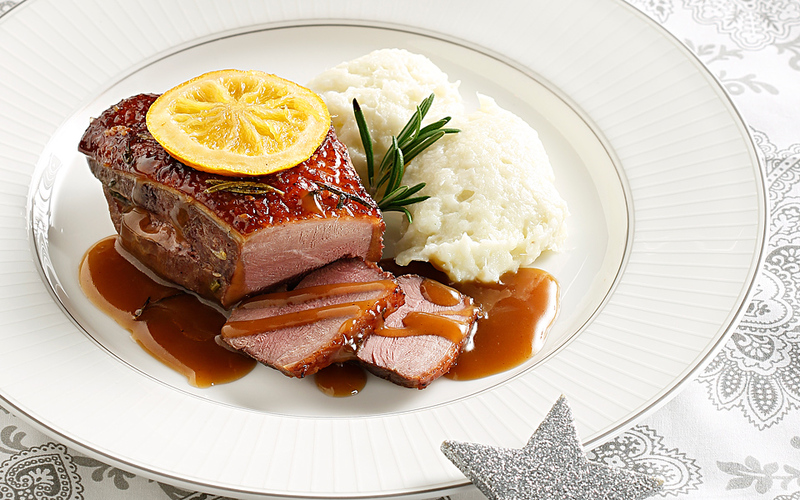 Duck cooked with herbs and oranges that's easy to prepare for an impressive result. A hint of Istanbul by a Greek chef creates this excellent, fairly easy dish. Resonant of the French duck à l’orange, it reflects the intermingling between the cuisines of Istanbul and Europe. The recipe was given to us by Niki Chrysanthidou, herself an Istanbulite Greek. Preheat oven to 160°C. In a roasting pan lay out the pieces of duck in a single layer. Season with salt and pepper, sprinkle with the 200 g of sugar and the rosemary. Pour on the 2 l of orange juice. Cover with foil and roast for 1½ hours. Remove the foil and roast for another 30 minutes or until done (you can check by sliding a knife through 1 – 2 pieces: the inside should not be brown or pink, but not red) and the skin has turned golden brown. Transfer the duck to a serving platter and cover with foil to keep warm. Place the drippings in the freezer for 30 minutes. Once cool, the fat will harden on the surface and you can easily skim it off and discard. Put the remaining juices in a saucepan and simmer for 6-8 minutes to reduce the gravy. In a skillet, heat the 7 tbsp of sugar over medium heat, until melted and golden. Add the 40 ml of warm orange juice and cook for 3-4 minutes until it starts to bubble. Add the orange slices and let cook for 2-3 minutes, until they caramelize. Remove from the stove. Pour some of the gravy over the duck (if you have made too much gravy, freeze it for future use). Garnish with the caramelized oranges. Serve with pilaf rice or mashed potato.